How do we get dark circles and how do we get rid of them? It’s disheartening to look in the mirror and see dark circles under your eyes. You might expect them after pulling an all-nighter, but what if those pesky shadows don’t seem to go away even with a full night’s rest? It turns out it’s not just a lack of sleep that can bring them on with genetics being most at fault. But don’t despair–it’s not too difficult to make them go away or at least appear lighter. In most cases, dark eye circles are blood vessels under the eyes that can be seen through the skin. Since deoxygenated blood is blue, when it passes close to the surface of the skin it gives off a bluish tint. If you’re fair skinned, unfortunately you can add dark eye circles after sunburns to your list of skin-related issues. Fair skin is more transparent allowing more of the blue tint of the blood vessels to show through. Other inherited traits that contribute to dark eye circles are having thinner skin than most, Periorbital Hyperpigmentaiton, and deep-set bone structure which can cause shadowing around the eyes. As we get older, skin loses collagen and thins out causing it to become more translucent. Skin also begins to sag which can cause shadowing around the eyes. The histamines released during an allergy attack inflame the blood vessels and cause swelling. Rubbing the eyes due to itching doesn’t help either as it can cause broken blood vessels. Anemia or an iron deficiency can result in dark eye circles as not enough oxygen reaches the body’s tissues. Liver problems can also be a cause. Any medications that make blood vessels dilate can cause eye circles to darken as well. According to the Mayo Clinic, nasal congestion can cause dark eye circles due to the veins that drain from your eyes to your nose becoming widened and darker. Try a neti pot or a saline spray to release some of the pressure. There are some simple steps you can take to improve the appearance of dark eye circles. Doubling up on pillows and sleeping more propped up can stop blood from pooling under your eyes. A five minute cold compress upon waking (or the classic cucumbers on the eyes) can help constrict blood vessels giving a more refreshed look. There are also a variety of eye creams on the market designed for dark eye circles. 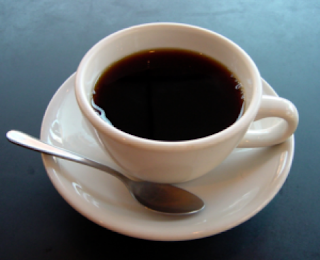 Some have caffeine to constrict blood vessels, some have green tea to strengthen capillary walls, some are collagen-building (retinol is the most famous of this kind). Eating a diet rich in Vitamin C, Vitamin E, omega-3 fatty acids and drinking plenty of water can drastically help your skin’s appearance including the skin around the eyes. When done correctly, makeup can mask even the darkest circles. First, apply eye cream and let it dry completely. Then choose a creamy concealer slightly lighter than your normal foundation to match the fairer skin around the eyes. Pat it along the circles and blend into the top of the check bone. Top with loose powder to set the makeup and keep it from getting caught in the creases. If you are unsure the cause of your dark eye circles, try gently stretching the skin under your eyes. If it becomes darker, it is probably due to genetics or aging as it shows the darkness is due to an underlying color and not the skin itself. If the color doesn’t change, it’s most likely due to allergies or UV exposure. 4 Easy Ways to Achieve a V-shaped FaceAnd here we have 5 easy ways for you to achieve a V-shaped face without the need of going under the knife. Follow the five tips below and you’ll be on your way to having a slimmer and toned V-shaped face! Tip #1 : Facial Slimming MassageThere are many techniques available for face slimming massage which includes the lymphatic draining technique, ‘Gua Sha’ technique and many more. You can use face slimming tools to compliment the facial massage for optimal results. We love the new OSIM uGEM Beauty Massager for face! It is a sleek and portable beauty massager offers a revitalizing vibration massage for a firm, younger and contoured face. For a more budget face slimming tool, you can try face rollers which are also very popular in Asian market and available in almost every beauty stores. Interestingly, you can also use a Chinese spoon for face slimming massage! Watch below video and try it now! Stick your tongue as far out as possible, facing the tip of your tongue upward. From that pose, tilt you heat back until a vertical line forms between you neck and your lower jaw, and hold for 10 seconds. Do 2 sets of this pose. Sticking your tongue out helps promote secretion of pancreatic gland hormones that is thought to have an anti-aging effect on your body. As all of us know makeup makes us look good and can certainly do magic tricks to our face for amazing results. You can indeed get thinner V-shaped face with makeup when you apply them correctly. If you have rounder face and your losing weight methods are not solving the issue, simply just invest your money on some makeup bronzer and highlighter for face contouring to enhance the face features. Watch the below video on the basics of how to contour with very simple steps to make your face look slimmer and thinner. These easy makeup tricks can take 10 pounds off your look, instantly — they’re optical illusions! Do you know that salt causes your body to retain much water and it leads to bloated face as well as a double chin? Do you notice that whenever you snack on junk food or any food loaded with lots of salt, you are likely to feel thirsty and your face will swell the next day? Well, it is due the high sodium content and this means you will need to say goodbye to chips, burgers, pizza, and other foods with high sodium content. Try to control the amount of sale you consume and start drinking more water! By reducing the sodium intake, you will feel your face less bloated or swollen. Besides, remember to ditch those processed foods in the fridge too. Go for healthier food like fruits and vegetables which help to reduce the face bloating. The fruits and veggies contain high percentage of water that keep your body hydrated and prevent your face from retaining water. Practice yourself to take at least three servings of veggies and fruits a day. These natural and healthy foods contain more fiber and lesser calories along with higher anti-oxidants which are why are highly recommended to those who want to stay fit. All in all, we are not saying that you should be ashamed of your face shape. 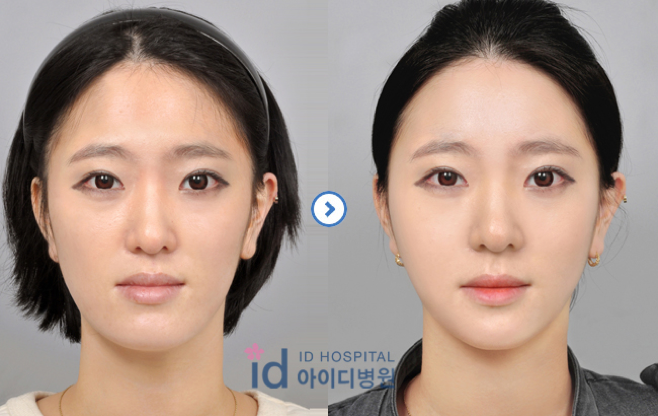 In fact, many women with round face tend to look younger than their true age and look more innocent too. 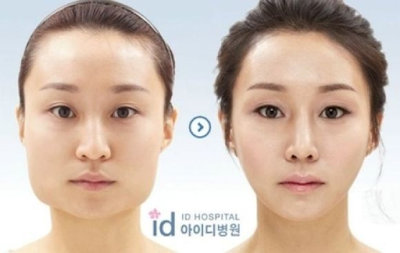 However, if you are troubled with bloated or puffy face and double chin, you’ll be surprised how the above 5 ways can define your natural face shape! Have in mind that above tips are not going to transform your face to an extreme degree (unlike plastic surgeries) but will let you achieve a natural defined and slimmer v-shaped face. Also, do check out the latest v-shape mask available in the market which can helps you to achieve a more defined and sharp face, no matter what face shape you are having! What’s the solution? Can foods actually help you whiten your skin? Without using any chemical products, skin care creams and treatments, you can naturally whiten your skin with foods. Healthy Diet – The Key to Bright and Radiant Skin? 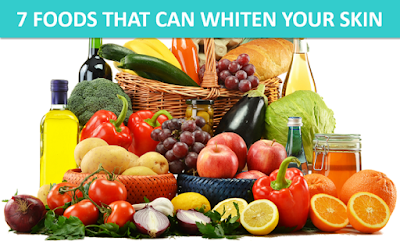 The key to whitening your skin starts from following a healthy colorful diet and active lifestyle. Without a proper diet, it is not possible to improve your skin tone. 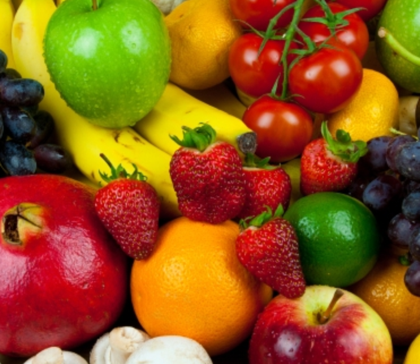 Fresh fruits and vegetables contain most of the nutrients required by the body. When you eat a healthy diet, it reverses many health problems, which can improve the skin tone. These foods contain fiber and nutrients to flush away the accumulated toxins. They cleanse the body internally, which also gives a natural glow externally on your skin. Here is a secret about tomatoes. Tomatoes are natural the sunscreen! Eating tomatoes protects your skin from harmful rays of Sun. It can treat the uneven skin tone. Watermelon is not just a summer fruit, but a great skin friendly fruit for brightening and lightening. Lemon is a natural bleaching agent enriched with antioxidants and vitamin C. Drink a glass of lemon juice a day, to cleanse your body, improve your skin tone and brighten the complexion. Orange contains Vitamin A and Vitamin C, the skin friendly vitamins. Orange helps in collagen production, which keeps the skin plump and glossy. Similarly, you can include kiwi, grapefruit, etc. It is the elixir of youth. Poms are a super fruit that can make wonders on your skin. It helps in secretion of fresh and pure blood, which itself naturally enhances your skin tone. Loaded with Vitamin B and micronutrients, this watery vegetable is a natural skin whitening food you can relish. Known for the richness of iron, copper and manganese, beetroot flushes away the toxins from the body. When the toxins are eliminated, it automatically enhances the skin. Drink a glass of fresh beetroot juice a day and notice your skin turning brighter and fairer with a beautiful glow. While we do have healthy skin whitening foods, we equally have unhealthy foods that damage the skin tone and accelerate aging. Stay away from these foods if you want to enhance your skin complexion. Drink a lot of water and natural drinks like young coconut, fresh fruit juices, etc to keep your skin moistened and hydrated. Drink green tea in place of coffee and other beverages to delay aging and enrich your skin with antioxidants. Beyond foods, get good sleep and consider trying a natural lightening cream that uses natural ingredients. 1. Stay out of the sun before your appointment. At *least* four weeks before, to be exact. You can't receive this treatment if you're sunburned — or even if you have a tan. 2. You must shave the area you’re getting lasered. Do NOT proceed to come in with your hairy self. This isn't like waxing, and you don't need to grow your unwanted hair out beforehand. On that note, you can't come in for laser hair removal if you've had a wax recently. Remember: The laser targets the PIGMENT of your hair follicle, and the follicle actually has to be there in order for this to work. The best thing you can do is shave a day before your appointment. If you don't, your physician will most likely provide you with a razor so you can get 'er done! 3. Your physician will provide a test patch on your skin at your first appointment. The sad truth is that not everyone's skin will react well to cosmetic laser treatments. Pigment problems, discoloration, and scarring can occur with some skin types, which is why it's important to allow your physician to conduct a small test patch first. 4. Your appointment can take anywhere from 20 minutes to an hour. It all depends on the area you're having treated. Underarms and bikini lines tend to be quick treatments, but other areas like the legs or back can take a little longer. Listen, I know cosmetic lasers may LOOK all pretty and innocent with their colored beams of light, but they can be seriously dangerous around the eyes. No matter where you're receiving treatment, you should always wear eye protection, which your physician will provide. 6. You can’t make an appointment for a full-body laser hair removal treatment. If someone tells you that you can, RUN FAR AND FAST. There's only a certain amount of cosmetic laser light and heat that your body should safely absorb each session. 7. If you want to see results, you have to be consistent. Hear me out: There's a good reason for this. Your hair follicles are on their own growth cycle. People who see the best results typically go in for treatment every four to six weeks in order to maximize the potential of zappin' the most follicles. This time frame allows the dead hair shafts to fall out on their own. 8. You should see prominent results after three months. After the first few treatments you might not see much of a difference, but I started to notice a dramatic drop in my unwanted follicles after the three-month mark — and even more after that. 9. Some hair and skin types can be a little harder to treat — but not impossible. Dark hair follicles are usually easy to treat because, again, the laser targets the hair's pigment. This is also why gray, white, blonde, and red pigments can be tricky. Darker tones can also be harder to treat, but not impossible. 10. The treatment itself isn't particularly relaxing. Every time the laser fires, it feels like someone is snapping you with a rubber band. Sounds SUPER enticing, right? But the long-term result should be worth the half hour of pain. Staying in shape is all about making good choices, and making them consistently. With the constant distractions of family and work or school, it can be easy for your body to slip out of shape before you even realize it. Fortunately, you don't need to pay constant attention to diet and exercise just to maintain your fitness level. You just need to pick up a few good habits and keep them. Take a brisk walk every day. Make walking a permanent part of your daily routine so you can enjoy cardiovascular health, stress management and weight loss. Pick a route with enjoyable scenery such as a park, or walk as part of your commute to work and back. Wear sneakers and dress in layers of comfortable clothes so you can adapt to any temperature. Walk for at least 30 minutes each day. Train with weights. Use resistance training to maintain muscle mass, promote bone health and stimulate your metabolism. Train three days per week performing exercises such as the chest press, leg press, seated row and overhead press. Most fitness centers will have a machine circuit you can follow. Train your entire body each workout. For more information on resistance training, go to the American Council on Exercise. Stay away from processed foods. Eliminating processed foods from your diet will help get rid of empty calories that tend to put on weight without offering much in terms of nutrition. Replace white flour, sugar and processed meats with brown rice, whole grains, fruits, vegetables and lean meats. Eat 5 to 6 small but balanced meals per day. Avoid stuffing yourself. Instead of eating until you are full, just eat until you are no longer hungry. Keep your motivation up by getting your friends and family involved with fitness. Maintaining a healthy lifestyle is easier when you have the support of people doing the same thing alongside you. If you have never weight-trained before, seek the guidance of an exercise professional to help get you started safely.